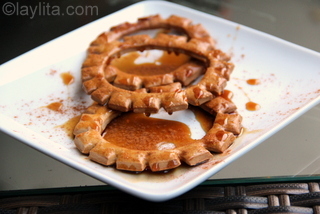 Pristiños are a traditional Christmas dessert in Ecuador. 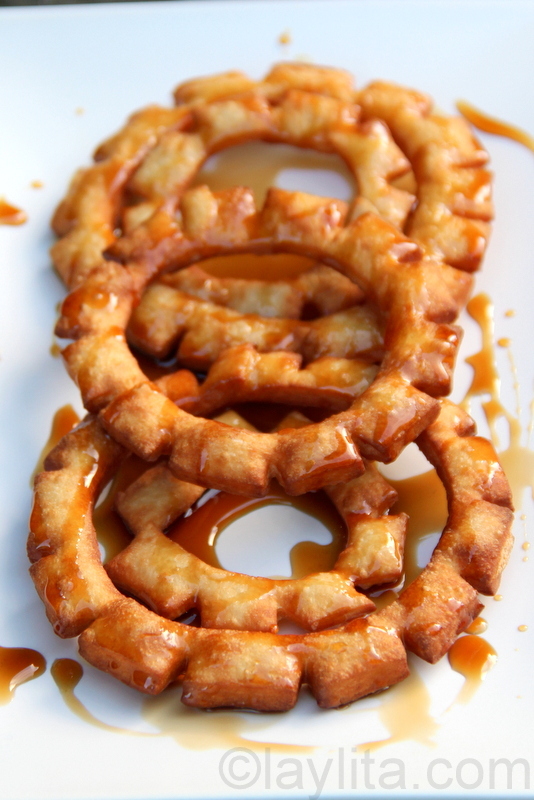 These fried pastries are served with miel de panela or piloncillo syrup. Pristiños are usually made in the form of a crown, but depending on the family who makes them they can have different shapes. 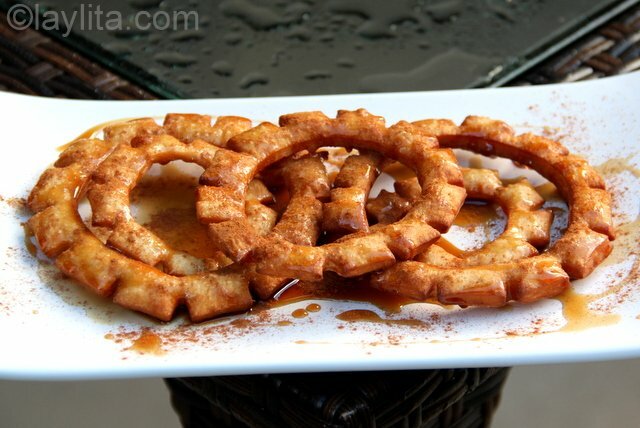 Pristiños are a cousin the better known buñuelos that are also a popular Christmas dessert in Latin American and Spain. 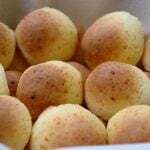 One of the main differences between pristiños and buñuelos is that pristiños are made with baking powder while buñuelos are made with yeast, the buñuelo dough is also a more liquid dough. In Ecuador, both are usually served with the panela syrup and buñuelos can also be made with corn flour and with yuca or cassava. When my husband tried pristiños for the first time he said they reminded him of a French fried pastry or fritter called les bugnes – which sounds a lot like buñuelos. In France they eat these during Mardi Gras. This in turn reminded me of some fried pastries called chiacchiere that Rossana, my Italian friend, makes during Carnavale (Italian Mardi Gras). There is likely a connection between the different European holiday fritters and the Latin American ones, and it is always interesting to see how each country (or region) adds its own distinctive touch to the recipe. 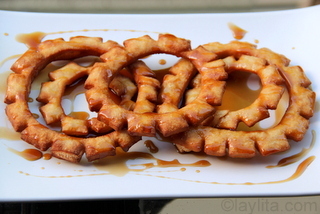 Pristiños are traditional Christmas fried pastries that are served with panela syrup or candied figs. 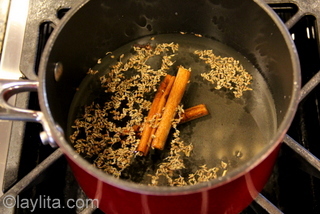 To make the spiced water, combine 1 cup of water, cinnamon sticks, cloves and anise seeds in a small saucepan and bring to boil, simmer for 15 minutes. 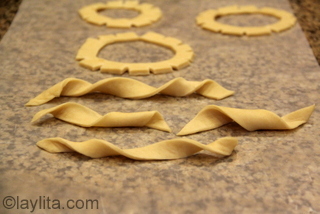 Remove from heat and strain out the spices, it should be lukewarm when added to the dough. 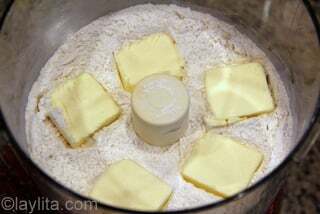 Combine the flour, sugar, baking powder and salt in the food processor and pulse until mixed. 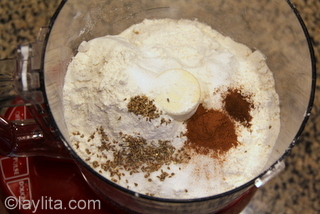 Add ground spices at this point if you are using plain water instead of spiced water. 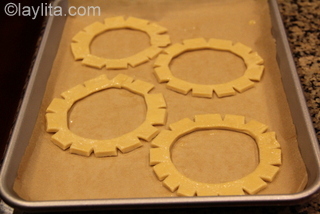 Add the butter, cut in small pieces, and mix well. Add the yolks, lemon juice, aguardiente and ½ cup of the spiced water. 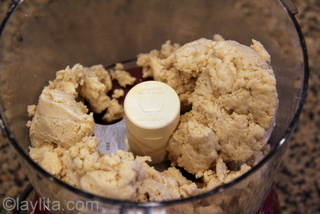 Mix until the dough start to form into small clumps, add additional spiced water, one tablespoon at a time, if needed. 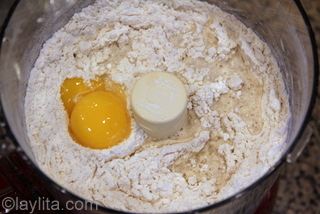 Remove the dough from the food processor, work it gently and form a ball. 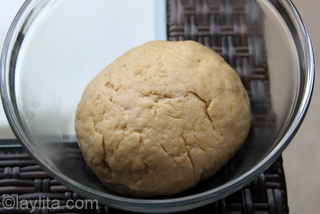 Let the dough rest at room temperature for about an hour. 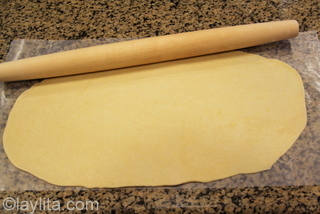 Take half of the dough and roll it out on a floured surface until you have a thin layer of dough. 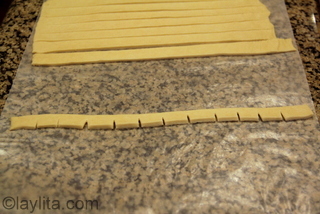 Use a knife to cut the dough into 1 inch wide and 6-10 inch long strips. Make small cuts that are about 1/3 to ½ deep into the side of each strip, then form the strip into a circle to make a crown like shape. 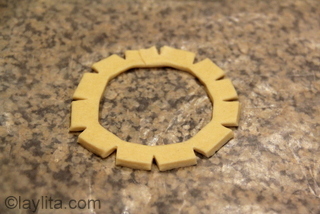 Press the edges together to seal the crown, use water or egg white to help glue the edges together if needed. Heat the oil in a medium sized frying pan, test by dipping the dough into the oil and if it sizzles then it’s ready. Carefully add the fritters to the pan. 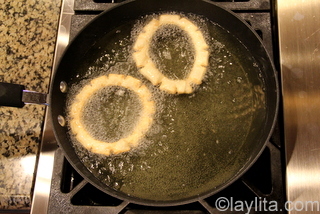 Do not overcrowd, fry 2-3 at a time depending on the size of the pan. Turn them over when golden. 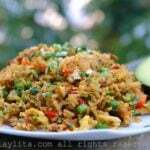 Remove pristiños from pan and place on plate with paper towels to drain any excess oil. 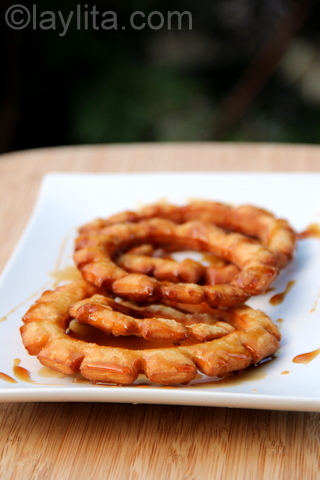 Serve warm with miel de panela o piloncillo spiced syrup. Can also be served with dulce de higos or figs cooked in panela syrup. 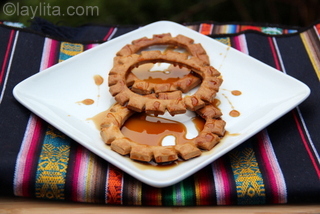 Honey can be used as a replacement or alternative for panela syrup. Sprinkle with ground cinnamon if desired. 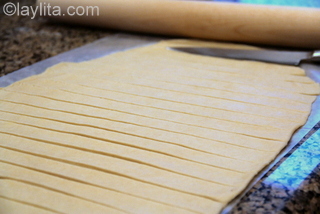 Brush with egg wash and bake in a pre-heated oven at 375F for 15-18 minutes or until golden. 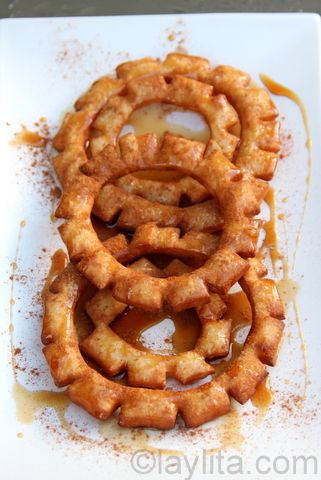 Serve with miel de panela and cinnamon. 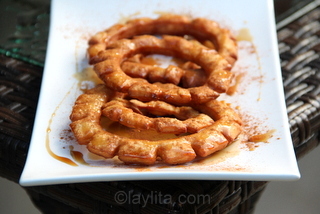 Pristiños are also served with dulce de higos or sweet figs candied in panela syrup. 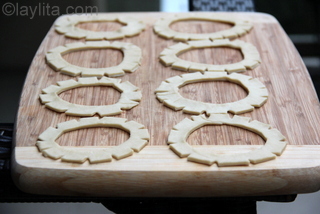 The dough for pristiños is very easy to make, as usual I like to make it easier by using the food processor. The dough is lightly spiced with cinnamon, clove and anise. The spices can either be added directly to the dough as you make it, or the more traditional method is to boil water with the spices and then use that spiced water for the dough. I’ve tried both ways and I prefer to make it with the traditional spiced water. As a good Ecuadorian I also add some aguardiente or sugar cane alcohol to the dough, you can use rum as a replacement for the aguardiente – or if you prefer not to use alcohol you can replace it with more of the spiced water. I also tested baking the pristiños as a healthier alternative. They are definitely a lot better when fried; they lose the airiness and become a little dense when baked. However, even baked they are still good, so I am including baking instructions in case anyone needs them – but my recommendation is to try them fried. The panela or piloncillo syrup is spiced with cinnamon and cloves, but I also like to give them an extra dusting of ground cinnamon. If you don’t have panela or piloncillo, or as in the case of my 10 year old don’t like the taste of panela, then you can use honey as a replacement for the panela syrup. I made these for my brother’s engagement party (he just proposed to his Ecuadorian girlfriend) and they were a big hit! I had to make the the Miel de Piloncillo with granulated cane sugar, as it was all I could find, and it was still delicious. Thank you! Hola. Quería preguntarte si los buñuelos son diferentes a los pristiños?. En mi casa la tradición siempre ha sido comer buñuelos en Navidad y me acuerdo de mis papis haciendo a mano!!!! Y creo q la receta es casi la misa, sin aguardiente talvez. La receta es muy parecida, los buñuelos son un poco mas esponjosos y se los suele hacer con levadura. Se mira rico esta receta, pero no le voy a poner aguardiente porque no me gusta eso. Pero gracias laylita por las recetas! 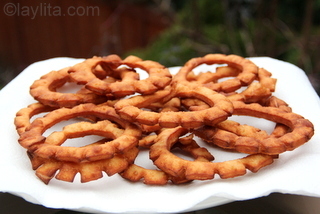 you know this also reminds me of Jalebi! So now we’ve gone as far east as India, I wonder if something similar can be found in china or japan?? La receta es rica en sabor. Mmm que ricos. Son como los pestiños españoles. 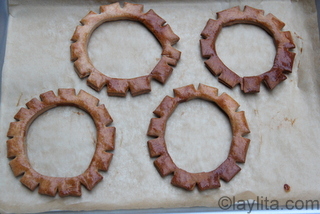 Gracias….will be surprising a very dear friend wth these rosquitas…. Feicidades a ti y tu familia! Un beso.